At the time of reporting, the price of a bitcoin had fallen slightly to around $1,134, according to the CoinDesk Bitcoin Price Index, though the general trend seems to be still rising. The sudden increase comes after a fall in prices following the rejection by the SEC of the Winklevoss brothers’ bitcoin ETF last month. Bitcoin had been trading at record highs last month in expectation of the announcement, at one stage closing on $1,300 per coin, and surpassing even the per-spot price for an ounce of gold – truly justifying bitcoin’s moniker ‘digital gold’ for the second time in its history. Further, there has been debate in the industry over the path forward for bitcoin and how best to scale the technology going forward. That discussion has led to talk of a ‘hard fork’ of the core software – a possibility that could split the digital currency into two rival coins. 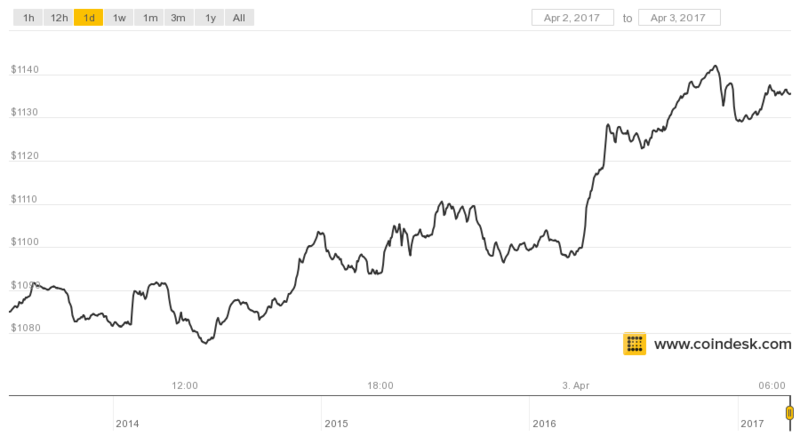 Fears over the issue seemed to have hit prices late last month, as bitcoin once again exchanged hands at sub-$1,000 prices mid-to-late March. While it’s never easy to directly link events in the real world to movements on the price charts, it would seem that bitcoin traders are shrugging off concerns over the scaling issue and still seeing the core value in the cryptocurrency.